Authors: Carlson, T.; Grear, M.; Copping, A.; Halvorsen, M.; Jepsen, R.; Metzinger, K.
Carlson, T.; Grear, M.; Copping, A.; Halvorsen, M.; Jepsen, R.; Metzinger, K. (2014). Assessment of Strike of Adult Killer Whales by an OpenHydro Tidal Turbine Blade. Report by Pacific Northwest National Laboratory (PNNL). pp 124. There is extraordinary energy contained in the movement of tides as water flow is forced through areas that are relatively shallow and narrow. This kinetic energy can be harnessed to provide electricity to communities located near such areas. Admiralty Inlet, located in Puget Sound of Washington State, has ideal topography/bathymetry to harness tidal flow for energy production, which has led the Snohomish County Public Utility District No. 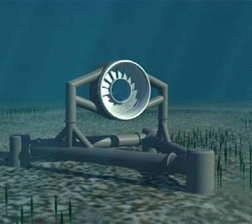 1 to pursue the deployment of two 6 m diameter OpenHydro tidal turbines. The National Oceanic and Atmospheric Administration (NOAA) Fisheries has responsibility for protecting the highly endangered Southern Resident Killer Whale (orca) population that lives in the region of the proposed tidal project. NOAA Fisheries is concerned that placement of the tidal turbines in Admiralty Inlet may pose a risk to three resident pods (a total of approximately 89 animals) of Southern Resident Killer Whales (SRKW). A stakeholder meeting (including representatives from NOAA, research, and industry) was held; all participants agreed that the risk of a random collision with an OpenHydro turbine blade is negligible. This conclusion was reached in part because SRKW spend greater than 97 percent of their time in the top 30 meters of water in Admiralty Inlet and the turbines would be placed at 55-meter depth, but also because they have highly evolved acoustic sensory capabilities that would enable them to detect the presence of a turbine and avoid it. NOAA’s primary concern is to understand the potential severity of a turbine blade strike to a SRKW should it occur, because a severe injury to a single individual could jeopardize the entire population of this long-lived species. It is possible, however, that a SRKW might approach a turbine out of curiosity. In order for a SRKW to penetrate the plane of the turbine blade with its rostrum, the animal would have to approach at a very specific angle and with careful timing relative to the moving blades. The geometry of the turbine ensures that the likelihood of such an encounter is small (Figure 1). 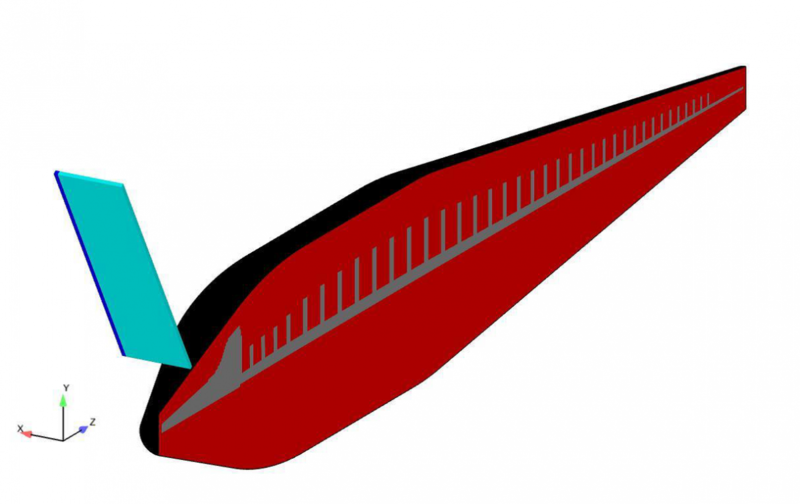 Because of the OpenHydro twelve-bladed horizontal axis turbine geometry, it is more likely that the whale would be hit with less force than has been calculated by the accompanying engineering analysis. For example, attempting to place a hand in a ceiling fan blade might result in a nick to one or more fingers but is unlikely to cause extensive damage to the whole hand, as one could not place the entire hand in the fan before the rotation of the blades would strike a portion (the fingers) of the hand. Calculations that characterize an encounter with a turbine could represent a range of risk to the SRKW influenced by many variables including the speed of the turbine blades, which vary with the speed of the tidal currents. The analysis presented here describes the worst-case scenario for potential injury to a SRKW from an encounter with a tidal turbine. The combination of SRKWs natural ability to avoid stationary objects; the difficulty of a SRKW positioning its rostrum fully into the slow moving turbine; and the SRKW’s tendency to reside in the upper portion of the water column, all reduce the likelihood that such an event will occur. Very little is known about the biomechanical properties of whale tissue under compression, particularly the skin, which functions to resist mechanical and other damage and to spread the force of an impact across a region that minimizes the stresses acting on underlying tissues. The lack of biomechanical data creates a challenge for estimating the potential biological effects of a turbine blade strike. PNNL tested SRKW tissue from two stranded SRKW in partnership with investigators at Friday Harbor Laboratory (FHL) at the University of Washington in January 2013. The samples tested were small portions of both skin and blubber from a three-year-old female (juvenile) and a newborn male (neonate). The tissue test results required considerable interpretation because the quality of tissue was noticeably degraded and there were few data for comparison. Additional data from other SRKWs, particularly tissues that are in good condition from animals over a range of ages, will be necessary to resolve the observed ambiguities. Researchers at the Pacific Northwest National Laboratory (PNNL) and Sandia National Laboratories (SNL) were tasked by the Department of Energy to carry out an analysis of the mechanics and biological consequences of an OpenHydro turbine blade strike on a SRKW. SNL built models of the turbine blades and their motion using specifications and data supplied by OpenHydro (Figure 1). SNL built a SRKW model based material properties from tissue testing; the geometry was based on literature data and anatomy from computed tomography (CT) scans of the head of an adult SRKW that died in 2002 (Figure 3). The biomechanical data used as an input to the engineering model was highly uncertain because of the degraded quality of the original tissue. Results of engineering analyses predict tissue damage at high-speed blade impacts under a worst case scenario. The speeds indicating potential tissue damage are at 3 m/s or higher, which occur less than the 6% of the operating time, further decreasing the likelihood of such an event. It is not clear however whether the degraded condition of the tissue samples make these results credible. The outcome of the worst case scenario at the maximum blade velocities for the Admiralty Inlet turbine is expected to consist of damage to the subcutaneous tissues (i.e., blubber layer) of the animal, resulting in minor hemorrhaging in the tissues (or the equivalent of a bruise) and perhaps some level of damage (such as bruising or tearing) to the skin. The biomechanical properties of the juvenile and the neonate tissues are highly uncertain and variable but appear to bracket the biomechanical properties estimated from the literature of other similar species. Results of the previous modeling work, using literature values and surrogate properties to represent the biomechanics of the SRKW tissues, and with the simpler engineering model, reach a similar conclusion as the final analysis: the improbable encounter of a SRKW with an OpenHydro blade in Admiralty Inlet is most likely to result in recoverable injury, such as bruising. A key index for evaluating the severity of head trauma in humans and other animals has been developed known as head injury criteria (HIC). Although such an index is not available for marine mammals, the process of developing a HIC might be instructive. While searching for pertinent literature on blunt force trauma, PNNL researchers looked for papers that might support the development of a marine mammal HIC or other types of risk assessment tools for interactions with objects. The engineering studies, biomechanical analyses, blunt force head trauma literature review, and model validation effort are discussed in detail and synthesized in the final report. Results of this study provide information that may assist NOAA Fisheries in their permitting decisions for the proposed tidal energy project in Admiralty Inlet, WA. This video displays the finite element model built by SNL, with biomechanical material properties developed from SRKW tissue testing performed by PNNL. The impact shown is modeled at 3m/s impact, based on high tidal velocities for the Admiralty Inlet project. In this model, only the blade is moving, with no forward velocity of the SRKW. The SRKW’s rostrum is positioned as far into the turbine as would be possible based on the OpenHydro geometry, maximizing the potential for injury. This orientation represents a worst case scenario for the animal. The red area represents a 50% strain, at or above which bruising might be expected; the green represents a 25% strain which is well within the normal strain limits of SRKW tissue.